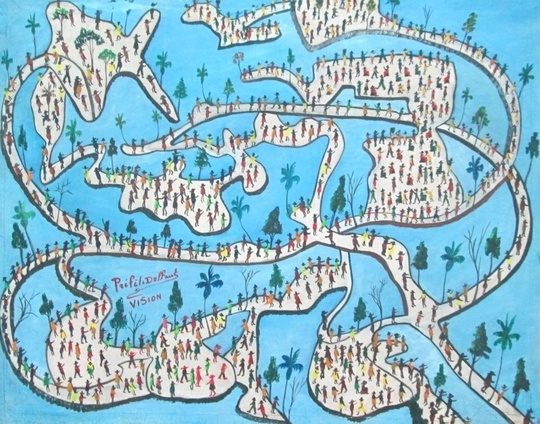 Préfète Duffaut (1 January 1923 – 6 October 2012) was a Haitian painter. Born in Cyvadier, Sud-Est, near the seaport of Jacmel, where he lived and worked. The painter Pauleus Vital (1918–1984) was Duffaut's half-brother, the painter Jean Charles Duffaut (*1970) is his son. Duffaut's mother died when he was two years old. Duffaut was one of the painters, alongside important Haitian artists such as Gesner Abelard and Rigaud Benoit, at the Centre d'Art in the Haitian capital. In the early 1950s Duffaut was one of several artists invited to paint murals in the interior of the Cathedral of Sainte Trinité (largely destroyed in the January 2010 earthquake) in Port-au-Prince; his works there were titled "The Temptation of Christ" and "The Processional Road" (also referred to as the "Procession of the Cross").